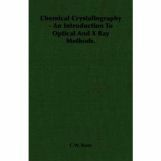 Crystallographic methods are used in chemistry for two main purposes: the identification of solid substances, and the determination of atomic configurations. There are also other applications, most of which, as far as technique is concerned, may be said to lie between the two main subjects. This book is intended to be a guide to these methods.